Product: Various components depending on indications treated. Mesotherapy is a medical technique devised in the 1950s by Dr Michel Pistor. It was first used to treat such conditions as rheumatism, sports injuries, and for the improvement of blood circulation. Mesotherapy has now been used successfully by practitioners for the treatment of cosmetic conditions, including skin rejuvenation and improvement, localised fat reduction and as a treatment for cellulite. If you are considering mesotherapy training, the following information will give you a basic understanding of the procedure. It can’t answer all your questions, since a lot depends on the individual patient and the practitioner. Mesotherapy will involve the injection of a specially prepared mixture of vitamins, amino acids, and medications, placed just millimetres under the skin into the problematic area of patients. You can inject the area requiring treatment directly, this is instead of relying on a tablet or intravenous injection where higher concentrations of the drug are required in order to get adequate levels to the site requiring treatment. Mesotherapy is both more precise and requires less solution to be injected. The actual preparation injected into the mesoderm (or surface layer of the skin) during Mesotherapy depends upon the problem being treated. In general, the substances used can include products that may reduce inflammation and treat veins, muscle relaxants, enzymes, vitamins, minerals, plant extracts and hormones to name a few. What other treatments can I combine with Mesotherapy to increase its efficacy? Mesotherapy treatments can be combined with other treatments to maximize the overall slimming process on your face and body. Liposuction can be used to create a more immediate slimming effect. Mesotherapy following. Liposuction will further tuck and tone problem areas. IPL Skin Tightening can also be used in conjunction with Mesotherapy to increase contour, tone and structure-tightening your problem areas while the Mesotherapy treatments reduce fat. Injections are given every 2-3 weeks. Most treatments require multiple sessions, and a full treatment course might take up to 5-10 treatments. The treatment is long lasting and the results measurable. When the desired effects are achieved, all that is required is general maintenance. Dieting and exercise are strongly encouraged to maintain one’s results over the long term. There is some discomfort. You will feel as if the clinician is pinching you. The discomfort is minor and most patient have the treatment without topical anesthetics. Immediately post treatment, you may feel some pain at the treatment site. This is more apparent on the hip area. The discomfort is temporary and will subside within days. There are no long term adverse response to mesotherapy and the product used to treat specific problems. How Can Mesotherapy treat cellulite? To treat cellulite using the mesotherapy procedure, the clinician will inject small amounts of homeopathic medicine immediately beneath the surface of the skin. Two different products will be use during the procedure, one product (metabolites) is used to break down fat and Condostrofin is used to break down the thick connective tissue bands that gives the orange peel effect present in Cellulite. The small puncture technique helps to stimulate the blood circulation. The combination of fat dissolve, connective tissue breakdown and improve circulation and drainage is the most effective means of treating cellulite. The activity of homeopathic remedies in a diseased organism takes place at a point where creation of a biological stimulation within the patient himself occurs, who, according to his own response mechanism to the illness, will react by eliminating the pathological state and all its symptoms. To treat localize fat accumulation with the mesotherapy procedure, the clinician will inject small amounts of homeopathic medicine immediately beneath the surface of the skin to breakdown fat and improve lymphatic drainage at the treatment site. 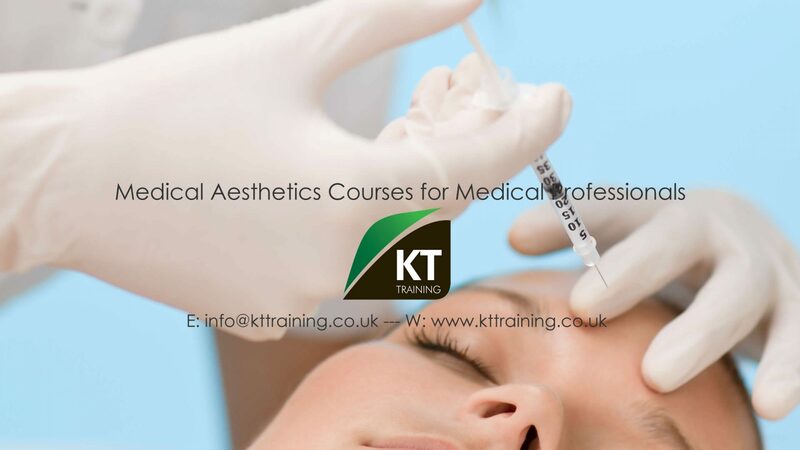 KT Training provide scheduled training courses for medical professionals. Patients are selected based on indications required for each course and appointment availability. We require patients for the following procedures. As a training company we cannot provide the recommended full course to achieve the best results for localised fat and cellulite mesotherapy treatments . Do not apply any creams with AHA acids. Drink a lot of water. Your skin will feel tender due to the number of injections. This sensation will disappear within 24 hours. Do not wash or shower for at least eight hours after your treatment. Do not use any lotions, creams or make-up for at least six hours, but 24 hours is better. Avoid the sun and wear a sun screen at all times. After cellulite (and some other types of treatments) DO NOT EXERCISE AT ALL for 48 HOURS. Exercising causes sweating and this will excrete your solutions from your pores and make the treatment ineffective.